Shrubs, along with trees, help to form the "bones" of the garden. Whether used for winter interest, as a screen to diminish an unsightly view, or grown for showy flowers, there is a shrub for every situation. Myrtle produces dense, fine foliage and small white flowers in spring followed by blue berries. Myrtle (Myrtus communis). Perennial in U.S. Department of Agriculture hardiness zones 8 through 10. Height and width 4 to 6 feet. Easily grown in well-drained soils, in sun or part shade, myrtle has dense, fragrant foliage that can be sheared for formal hedges. Evergreen. (Ligustrum japonicum 'Texanum'). Grows up to 10 feet high and 6 feet wide in USDA zones 7 through 11. Glossy foliage looks handsome year round, with white blooms appearing in spring. 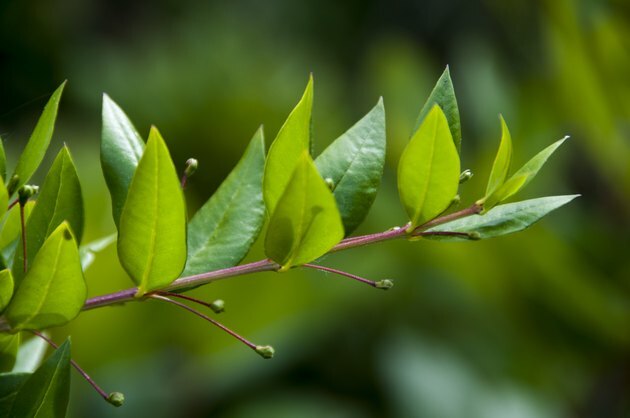 Waxleaf privet requires regular water, grows well in sun or part shade, and tolerates pruning to shape. Evergreen. Red-spotted flowers grace the purple rockrose in spring. Purple rockrose (Cistus x purpurea). Requires well-drained soil and full sun in USDA zones 8 through 11. Grows 4 feet high and 4 to 6 feet wide. 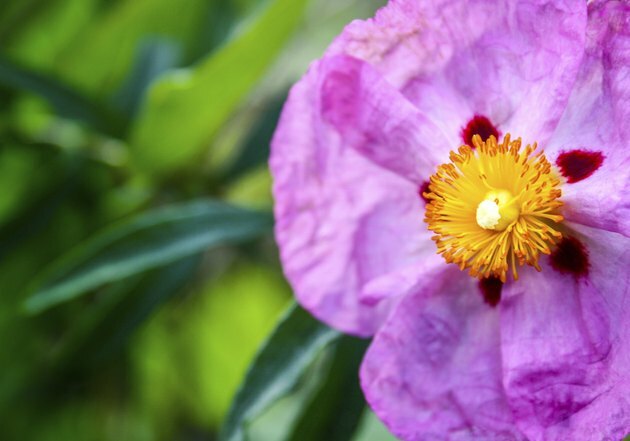 Pretty spring blooms attract butterflies and belie the purple rockrose's ability to withstand dry conditions. Evergreen. Creosote bush (Larrea tridentata), USDA zones 8 through 10. Typically reaches 3 to 8 feet in height and width. With fine foliage that smells like desert rains, creosote bush produces small yellow flowers in the spring. Evergreen. Azaleas in bloom are a harbinger of spring. Azaleas ( spp.) grow in USDA zones that vary with cultivar, and there are many. 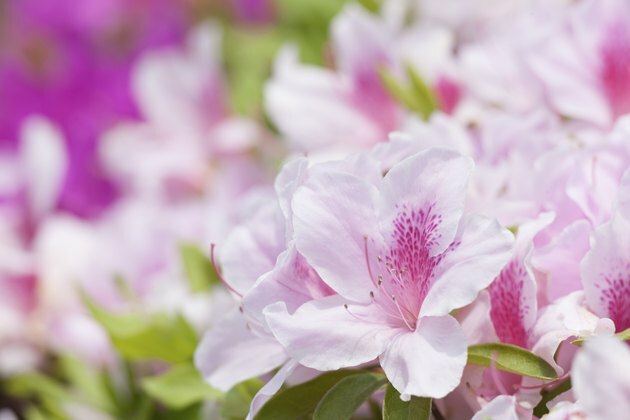 Evergreen azalea flowers come in all shades of pinks and whites, while deciduous azaleas have blooms that range in color from white and pink to yellow, orange and red. All azaleas thrive in moist, acidic soil in an area of the garden that receives afternoon shade. Forsythia (Forsythia x intermedia 'Beatrix Farrand') grows 6 to 8 feet high and wide in USDA zones 5 through 8. Cheery yellow flowers cover the bare branches in spring. Thrives in full sun and well-drained soil. Deciduous. 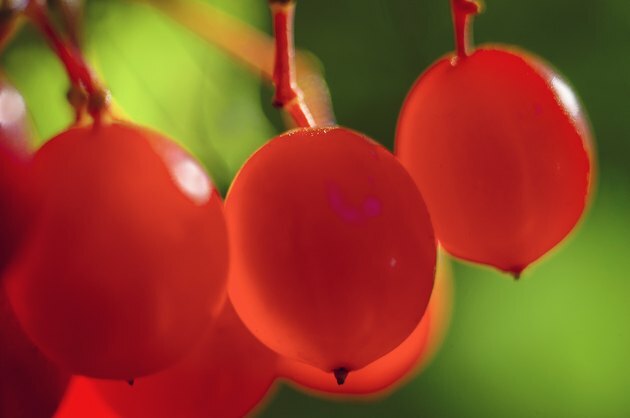 The berries of the highbush cranberry can be preserved in jellies or jam. "(Ref. 13)"
American cranberry bush or highbush cranberry (_Viburnum trillium) t_hrives in sun to part shade in USDA zones 2 through 8. Large deciduous shrub that reaches 8 to 15 feet high and 8 to 10 feet wide. Produces white lacecap flowers in the spring and has edible fruit in summer purple-red foliage in fall. Highbush cranberry tolerates average soil provided it is well-drained. Oak leaf hydrangea (Hydrangea quercifolia). USDA zones 5 through 9. Reaches 6 to 8 feet high with similar spread. Grown in moist soil in part shade, this shrub rewards the gardener with white flowers in early summer followed by a show of crimson leaves in the fall. Deciduous. Lilacs' perfumed blooms come in white, pink, and shades of purple. (S__yringa) sp. USDA zones 3 through 7, although some species are hardy only to zone 4. They can vary in height from 4 feet to 20 feet. 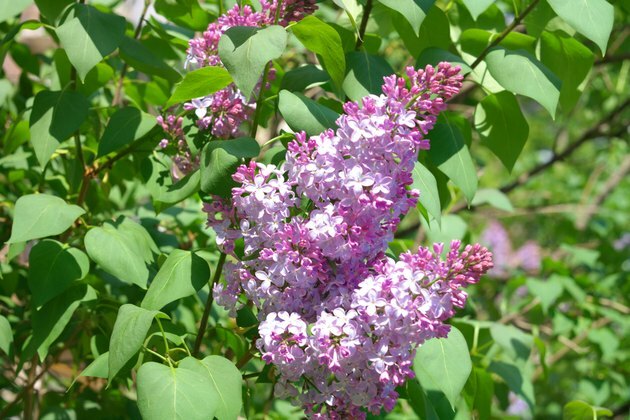 What lilacs have in common are showy, fragrant flowers in the spring and a preference for sunny sites with well-drained soil. Deciduous. (Gardenia jasminoides), hardy in SDA zones 8 through 11. Well-known for its perfumed white blossoms from mid-spring to early summer, gardenias like rich, acidic soil and shady conditions. Grows up to 6 feet high and wide. Evergreen.